This article is about the media company that existed from 1980 to 2013. For the companies split off in 2013, see 21st Century Fox and News Corp (2013–present). The original incarnation of News Corporation (abbreviated News Corp.) was an American multinational mass media corporation operated and owned by media mogul, Rupert Murdoch, headquartered in New York City. Prior to its split in 2013, it was the world's fourth-largest media group in terms of revenue, and News Corporation had become a media powerhouse since its inception, almost dominating the news, television, film and print industries. News Corporation was a publicly traded company listed on the NASDAQ. Formerly incorporated in Adelaide, South Australia, the company was re-incorporated under Delaware General Corporation Law after a majority of shareholders approved the move on November 12, 2004. 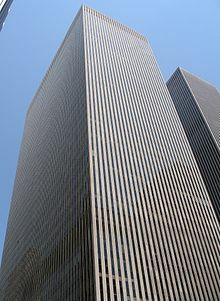 News Corporation was headquartered at 1211 Avenue of the Americas, New York, in the newer 1960s–1970s corridor of the Rockefeller Center complex. In 1982, News Corp bought two eighths of the movie studio 20th Century Fox, buying the other half in 1984. Also in 1984, News Corp bought Travel Weekly and other trade magazines from Ziff Davis. In 1985, News Corp announced it was buying the Metromedia group of stations, setting the stage for the launch of a fourth U.S. commercial broadcasting television network. On September 4, 1985, Murdoch became a naturalized citizen to satisfy the legal requirement that only United States citizens could own American television stations. In 1986, the Metromedia deal closed, and the Fox Broadcasting Company was launched. This network, known on-screen as "Fox", can now be picked up in over 96% of U.S. households. In February 2007, Murdoch announced at the McGraw-Hill Media Summit that Fox would launch a new business news channel later in the year, which would compete directly against rival network CNBC. Murdoch explained that the channel would be more "business-friendly" than CNBC, because he felt that they "leap on every scandal, or what they think is a scandal." In July 2007, News Corp. reached a deal to acquire Dow Jones & Company, owners of The Wall Street Journal, of $5 billion for. Despite CNBC already having a contract with Dow Jones to provide content and services to the network, Fox officially launched the Fox Business Channel on October 15, 2007. Alexis Glick, the network's original morning show host and vice president of business news, indicated that its lawyers had reviewed the details of Dow Jones' contract with CNBC, but noted that it would still "actively use" other Dow Jones properties. In late February 2011, News Corp officially put the now-struggling Myspace up for sale, which was estimated to be worth $50–200 million. Losses from the last quarter of 2010 were $156 million, over double of the previous year, which dragged down the otherwise strong results of parent News Corp. Its struggles were attributed to the growth of the competing social network Facebook. The deadline for bids, May 31, 2011, passed without any above the reserve price of $100 million being submitted. The rapid deterioration in Myspace's business during the most recent quarter had deterred many potent suitors. Later in June, Specific Media and pop singer Justin Timberlake bought the site for $35 million, which CNN reported noted was "far less than the $580 million News Corp. paid for Myspace in 2005." Murdoch went on to call the Myspace purchase a "huge mistake". On July 13, 2011, Rupert Murdoch announced that the company would withdraw its takeover bid for BSkyB due to concerns relating to the News of the World scandal. News Corporation already owned, and continues to own, 39.1% of BSkyB. On June 6, 2012, News Corporation announced that it would buy out ESPN Inc.'s stake in ESPN Star Sports to gain full control over the Asian sports network. In January 2013, News Corp. attained 54.5% majority control of Sky Deutschland. On February 4, 2013, News Corporation announced the sale of IGN and its related properties to the publishing company Ziff Davis. News Corp. had planned to spin off IGN as an independent company, but failed to do so. In July 2011, News Corp closed down the News of the World newspaper in the United Kingdom due to allegations of phone hackings. The allegations include trying to access former Prime Minister Gordon Brown's voice mail, and obtain information from his bank accounts, family's medical records, and private legal files. Allegations of hacking have also been brought up in relation to former Prime Minister Tony Blair, and the Royal Family. Other allegations put out by The Guardian newspaper include the exploitation, with intent to gain access to or use private information, of a list of 4,332 names or partial names, 2,987 mobile phone numbers, 30 audio tapes of varying length and 91 PIN codes, of a kind required to access the voicemail of the minority of targets who change the factory settings on their mobile phones. The names are said to include those of British victims of September 11, 2001 terror attacks, family members of victims of the "7/7" bombings on London's transit system, family members of British troops killed overseas, Milly Dowler, a 13-year-old missing British girl who was later found dead, actor Hugh Grant and a lawyer representing the family of Princess Diana's lover at the inquest into her death. On July 13, 2011, News Corp withdrew its bid to purchase the final 61% stake in BSkyB after pressure from both the Labour and Conservative Parties in Parliament. Allegations about the violation of ethical standards by the News Corporation subsidiary News of the World have been speculatively applied to News Corporation holdings in the United States. Senator John Rockefeller (D-WV) stated on July 12, 2011 that there should be a government investigation into News Corporation "to ensure that Americans have not had their privacy violated." His statement was echoed on Wednesday by Sen. Robert Menendez (D-NJ), who specifically requested an investigation into 9/11 victims, as well as Sen. Frank Lautenberg (D-NJ) who encouraged an investigation by the Securities and Exchange Commission. On July 13, 2011, Representative Peter King (R-NY) wrote a letter to the FBI requesting an investigation into News Corporation's ethical practices, and on July 14, the FBI opened a probe into the hacking of 9/11 victims. Les Hinton, chief executive of the media group's Dow Jones, resigned on July 15, saying, "I have seen hundreds of news reports of both actual and alleged misconduct during the time I was executive chairman of News International and responsible for the company. The pain caused to innocent people is unimaginable. That I was ignorant of what apparently happened is irrelevant and in the circumstances I feel it is proper for me to resign from News Corp, and apologize to those hurt by the actions of the News of the World." 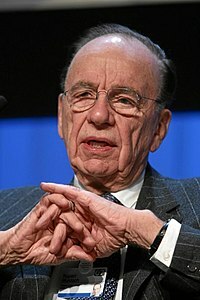 On June 28, 2012, Rupert Murdoch announced that, after concerns from shareholders in response to the recent scandals and to "unlock even greater long-term shareholder value", News Corporation's assets would be split into two publicly traded companies, one oriented towards media, and the other towards publishing. News Corp's publishing operations were spun out into a present-day News Corporation with Robert James Thomson, editor of The Wall Street Journal, as CEO. The present News Corporation, which retains most of its media properties (such as the Fox Entertainment Group and 20th Century Fox) and Murdoch as CEO, was renamed 21st Century Fox. Murdoch remains chairman for both companies. Shareholders approved the split on June 11, 2013. On June 19, 2013, preliminary trading for the new News Corp on the Australian Securities Exchange commenced in preparation for the formal split that was finalized on June 28, 2013. Shareholders received one share of New News Corp for every four shares they owned of the old News Corp. The two new companies began trading on the NASDAQ on July 1, 2013. 21st Century Fox and most of its businesses were later acquired by the Walt Disney Company four years later; except its US broadcast, sports, and news assets which were spun-off to Fox Corporation which would be retained under Murdoch ownership. List of companies and businesses owned by News Corporation prior to its formal split on June 28, 2013. All media and broadcasting assets, except media assets owned by News Limited, now belong to 21st Century Fox, its legal successor. Meanwhile, newspapers and other publishing assets, including media assets under News Limited, were spun off as a new News Corp.
News Corp agreed to sell eight of its television stations to Oak Hill Capital Partners for approximately $1.1 billion as of December 22, 2007. The stations are US Fox affiliates. These stations, along with those already acquired by Oak Hill that were formerly owned by The New York Times Company, formed the nucleus of Oak Hill's Local TV LLC division. ^ "News Corp investors agree US move". BBC News. October 26, 2004. Retrieved March 27, 2010. ^ Fabrikant, Geraldine (April 7, 2004). "Market Place; News Corp. Plans to Follow Its Chief to the United States". The New York Times. Retrieved March 27, 2010. ^ "Forbes". Forbes. Retrieved April 1, 2015. ^ "Fortune". CNN. Retrieved May 20, 2010. ^ "PowerPoint Presentation" (PDF). Archived from the original (PDF) on September 16, 2010. Retrieved July 11, 2011. ^ Siklos, Richard (February 9, 2009). "Why Disney wants DreamWorks". CNN. Retrieved May 20, 2010. ^ "News Corporation – Annual Report 2007". Newscorp.com. June 30, 2007. Archived from the original on June 29, 2011. Retrieved July 11, 2011. ^ Wayne, Leslie (November 22, 1984). "Murdoch Buys 12 Ziff Publication". The New York Times. ISSN 0362-4331. Retrieved July 21, 2018. ^ a b Revolution on Fleet Street, TIME magazine, August 21, 1996. ^ Eichenwald, Kurt (August 8, 1988). "THE MEDIA BUSINESS; Murdoch Agrees to Buy TV Guide In a $3 Billion Sale by Annenberg". The New York Times. ISSN 0362-4331. Retrieved July 21, 2018. ^ Fabrikant, Geraldine (May 6, 1989). "Murdoch to Sell Travel Businesses". The New York Times. ISSN 0362-4331. Retrieved July 21, 2018. ^ Palmer, Rhonda (July 27, 1993). "Murdoch catches rising Star". Variety. ^ Shenon, Philip (August 23, 1993). "THE MEDIA BUSINESS; Star TV Extends Murdoch's Reach". The New York Times. ^ George Monbiot (April 22, 2008). "The most potent weapon wielded by the empires of Murdoch and China | Comment is free". London: The Guardian. Retrieved July 11, 2011. ^ "Tax free: Rupert Murdoch's zero status". BBC News. March 25, 1999. Retrieved April 25, 2010. ^ Lazaroff, Leon (January 11, 2005). "Murdoch to buy out Fox shares". Chicago Tribune. Retrieved October 11, 2012. ^ "News Corporation Completes Acquisition of Fox". News Corp. Retrieved October 11, 2012. ^ Lapinski, Trent (September 11, 2006). "MySpace: The Business of Spam 2.0 (Exhaustive Edition)". ValleyWag. Archived from the original on March 12, 2008. Retrieved March 13, 2008. ^ "News Corp in $580m internet buy". BBC News. July 19, 2005. Retrieved March 13, 2008. ^ a b c Haden, Jeff (January 12, 2011). "MySpace Layoffs Are A Good Reminder how Uncool Rupert Murdock's acquisition of the social media was?". Business.time.com. Retrieved June 30, 2012. ^ "Murdoch Wins His Bid for Dow Jones". Wall Street Journal. Retrieved May 11, 2013. ^ Fox Business Network blazes new trail, USA Today, 14 October 2007. Retrieved October 17, 2007. ^ Rupert Murdoch's News Corp launches global service to link all its outlets, Guardian.co.uk, 7 September 2009. Retrieved September 15, 2010. ^ Staff writers of The Australian (September 15, 2010). "News Limited sells Fiji Times to Fijian company Motibhai". The Australian. Retrieved January 29, 2011. ^ "News Corp taps Allen & Co for MySpace interest – sources". Reuters. February 5, 2011. ^ a b Vascellaro, Jessica E. (June 30, 2011). "News Corp. Selling Myspace to Specific Media". The Wall Street Journal. Retrieved October 23, 2011. ^ Chandrasekhar, Indu; Wardrop, Murray; Trotman, Andy (July 7, 2005). "News of the World phone hacking scandal: timeline". London: Telegraph. Retrieved July 14, 2011. ^ "News Corp to buy out ESPN from ESS, Sawhney to leave". The Hindu. June 6, 2012. ^ Christoph Steitz & Harro Ten Wolde (January 14, 2013). "News Corp to grab control of Sky Deutschland". Reuters. ^ "News Corp.'s IGN Poised to Sell to J2's Ziff Davis". Wall Street Journal. Retrieved February 4, 2013. ^ "IGN Entertainment sold by News Corp to publisher Ziff Davis". Digital Spy. Retrieved February 4, 2013. ^ Nick Davies & David Leigh (July 11, 2011). "News International papers targeted Gordon Brown". London: The Guardian. Retrieved July 14, 2011. ^ a b "Our phone hacking victims list". London: Guardian. July 12, 2011. Retrieved July 14, 2011. ^ Holton, Kate (July 13, 2011). "UPDATE 1-BSkyB investors eye cash after deal collapse". Reuters. Retrieved July 14, 2011. ^ a b Stelter, Brian (July 13, 2011). "News Corp. Newspapers May Face U.S. Inquiry". The New York Times. Retrieved July 14, 2011. ^ "U.S. lawmakers urge feds to investigate Murdoch media company". July 14, 2011. Retrieved December 5, 2017. ^ Rashbaum, William (July 14, 2011). "F.B.I. Opens Inquiry Into Hacking of 9/11 Victims". The New York Times. Retrieved July 14, 2011. ^ BBC, BBC. "News Corp's Les Hinton resigns amid phone-hack scandal". BBC. Retrieved July 14, 2011. ^ "News Corp confirms plan to split the media giant". BBC News. June 28, 2012. Retrieved June 28, 2012. ^ "News Corp. Will Use Fox Name as Breakup Proceeds". Bloomberg. Retrieved December 3, 2012. ^ Sweney, Mark (December 21, 2012). "News Corp's head of demerged newspaper arm may take home £2.5m". The Guardian. Retrieved December 26, 2012. ^ Szalai, Georg (May 28, 2013). "News Corp. Unveils Post-Split Logo Based on Rupert Murdoch's Handwriting". The Hollywood Reporter. Retrieved May 29, 2013. ^ "Rupert Murdoch splits empire but keeps faith in tomorrow's newspapers". The Guardian. June 18, 2013. Retrieved June 18, 2013. ^ Wall, Matthew (June 11, 2013). "News Corp shareholders vote to split company into two". BBC News. Retrieved June 11, 2013. ^ "'New News Corp' makes muted stock market debut". Retrieved June 19, 2013. ^ News Corp and Liberty Media, USA Today, December 22, 2006. ^ News Corp Murdoch trust sells shares, The Age, November 16, 2007. ^ Macleod, Scott (December 1, 1997). "Prince Alwaleed: The Prince and the Portfolio". Time. Archived from the original on September 13, 2010. Retrieved August 24, 2010. ^ Gustin, Sam (August 16, 2010) "News Corp., the Saudi Prince and the 'Ground Zero Mosque'", Daily Finance (AOL), via Rich, Frank (August 21, 2010) "How Fox Betrayed Petraeus",The New York Times, p. WK8 NY ed.. Retrieved August 22, 2010. ^ "Murdoch's Pebble Beach shindig". Australian Broadcasting Corporation. Retrieved December 1, 2007. ^ Brook, Stephen (July 28, 2006). "Bono and Blair to join Murdoch on the beach". The Guardian. UK. Retrieved December 1, 2007. ^ Hinsliff, Gaby (July 23, 2006). "The PM, the mogul and the secret agenda". The Guardian. UK. Retrieved December 1, 2007. ^ Greenslade, Roy (August 20, 2010). "Fox News quiet on News Corp's $1m donation to Republicans". The Guardian. London. Retrieved July 14, 2011. ^ a b "News Corp. gave $1 million to pro-GOP group – Ben Smith". Politico.Com. Retrieved July 14, 2011. ^ Archipelago, World. "Company Profile HarperCollins Publishers Global". corporate.harpercollins.com. Retrieved May 4, 2017. ^ a b c d e f g h "What does Rupert Murdoch own? A little bit of everything". USA TODAY. Retrieved August 28, 2018. ^ Kercheval, Nancy & Danielle Rossingh (December 22, 2007). "News Corp. to Sell U.S. TV Stations for $1.1 billion (Update5)". Bloomberg. Retrieved December 22, 2007. ^ It's Official: News Corp Buys 49% Of YES Network. Deadline.com. Retrieved on July 21, 2013. ^ "tadpolenet.com". tadpolenet.com. Archived from the original on August 1, 2007. ^ "News Corp Makes Social-Media Push". The Wall Street Journal. December 20, 2013. Retrieved December 21, 2013. ^ "News Corp to Buy Video Platform Unruly for $90 Million". The Wall Street Journal. September 16, 2015. Retrieved September 16, 2015. ^ "Making Fun debuts as the video-game arm of Rupert Murdoch's empire". VentureBeat. February 25, 2011. Retrieved July 11, 2011. This page was last edited on 13 April 2019, at 05:18 (UTC).